Priya Verma – Actress, Water Conservationist and Space Scientist. Water Conservationist, Actress and Space Scientist. Priya Verma of Chandigarh, India, has achieved more in her seventeen years than most people do in a lifetime. She has developed a technique to conserve underground water. She has acted in several movies and television programs in India. She has proposed a new and reliable theory of the origin of universe that has been recognized by NASA and the Nobel Prize Society of Scholars (NSHSS). Her stories have been published in leading Indian newspapers. She has received numerous awards and recognitions from governments of several countries across the world. Read more about Priya and be inspired to achieve everything you’ve always wanted to! We all have our strengths. Some of us are good at science, some are good at music or art while still others have developed ideas that have made this world a better place to live. But, Priya Verma, our Amazing Kid for the Month for June, has done it all. She describes herself as a ‘multi-faceted personality’ and one look at the variety of her achievements will tell you why. Priya understood the importance of water very early in life. She realized the danger our water resources are facing today. “Water is the most important resource for the existence of life on earth. But, the resources of water on our beloved planet are in danger of being exhausted in near future. This is the time to conserve and preserve our current water resources for future generations” she explains. To do her part, Priya developed a technique to harvest rainwater and to increase the underground water resources. These techniques were part of a project titled “Increasing Underground Water Resources” and have been accepted by the Government of India, UNEP and organizations worldwide. “If over pumping and wastage of water is not stopped immediately the underground water resources will be exhausted which will have a bad impact on our ecology as there will be no forests, plants and animal species and the world will become a desert soon.” she says. The ideas suggested in the project are novel, cost effective, eco-friendly, utilitarian and universally applicable. The project has also been recognized by several organizations like the Conrad Foundation USA, Teens Planet Earth, Takingit Global, Roots & Shoots USA among others. 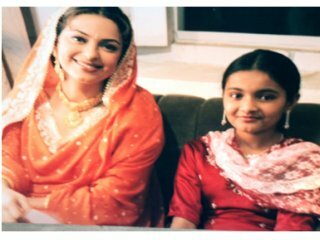 Acting is another passion for Priya. “In India, as many as 1000 films are produced each year in different languages. Bollywood films are usually musicals. It’s fun and very expressive and there’s a lot of deep meaning behind music in the films. You can actually express what the music means, through the graceful movements of the body.” she explains. Priya has worked in films, television serials, music albums, stage shows and has done modeling and anchoring assignments for television. She takes up these assignments during her summer break and makes sure that her education is not affected. Priya is also an accredited writer. She has penned more than 600 articles , poems and stories on several issues and these have been published in leading Indian newspapers like The Hindustan Times, Tribune, Indian express, Times of India and many magazines. “My aim is to create awareness in children and in the society. I am a online writer. Journalist and reporter and a member of AYJW, USA, India post, Amazing Kids, Article base, Jet article, TakingITGlobal and many other national and international organizations, I am a strong supporter of Women Empowerment and a member of Girl’s 20 Summit of G20 Nations, Student world Assembly and Youth organizations worldwide.” she tells us. And, If you thought Priya was not keen on science or math, then listen to this. 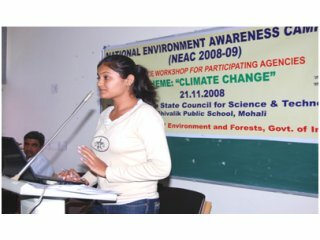 She has represented India in NASA SPACE SETTLEMENT DESIGN CONTEST-2009 and designed and developed a future city named ARYA to settle humans in space. She propounded a new and reliable theory of the origin of universe in 2008 which was accepted and appreciated by the National Innovation Foundation of India and Indian Space Research Organization (ISRO) and is under study by the scientists across the world. “Being a student, shortage of time is my biggest hurdle. I have to strike a balance between my studies and extra- curricular activities. As a result, I have had to leave many good offers/assignments. Hard work is always the key to my success. I am lucky that I got support from my family for whatever I do.” she says. 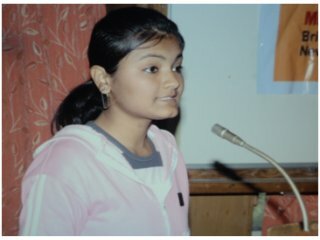 ● Priya was selected for the Claes Nobel Academic Scholarship award for excellence in academics,leadership, and community service from the Nobel Prize Society of Scholars (NSHSS) at a ceremony in Washington, D.C..
● She received the Diana Award 2008-09 from British Prime minister Mr. Gordon Brown. ● Singapore Environment Council, Singapore has shown keen interest in her eco-friendly technologies and have highlighted her innovation in their publications. ● Global Policy Innovation, USA has also appreciated water conservation project..
● Her project has also been accepted by the International Technology Innovation Awards by Wall Street Journal USA, Green awards, Tech Museum Awards 2008, Kilby International Awards, Eco Hero Awards, USA and many more and creating awareness in the world to save water through my innovation and efforts and bringing name and fame to my country in such a small age. ● Priya was presented with the “National Youth Award-2007” by the Government of India. ● Her project has been selected for the International Young Eco-Hero Awards-2008 by the Action For Nature, USA an reputed International environmental organization. I have been also selected for the International GLOBAL YOUNG LEADERS CONFERENCE 2008 and 2009 from India by the GYLC, USA. ● Her Project has been approved and included in the WORLD SUMMIT YOUTH AWARD, Austria in GO GREEN category organized by UN,UNESCO &other agencies. ● Her project is also recognized by Epsilon Sigma Alpha International, USA and displayed in an exhibit of pictures along with my Project in their International Conference in San Antonio, Texas from 12 to 18 July 2009 to recognize my work. Priya’s success only makes us wonder what future holds for her. Here at Amazing Kids, we’ll be keenly watching her an wish her good luck in everything she does.